I haven't done a decor post in a while and it's because we really haven't needed to change anything in our home, but now the itch is back and I'm looking to make a little update in our bedroom since we've decided to stay another year. 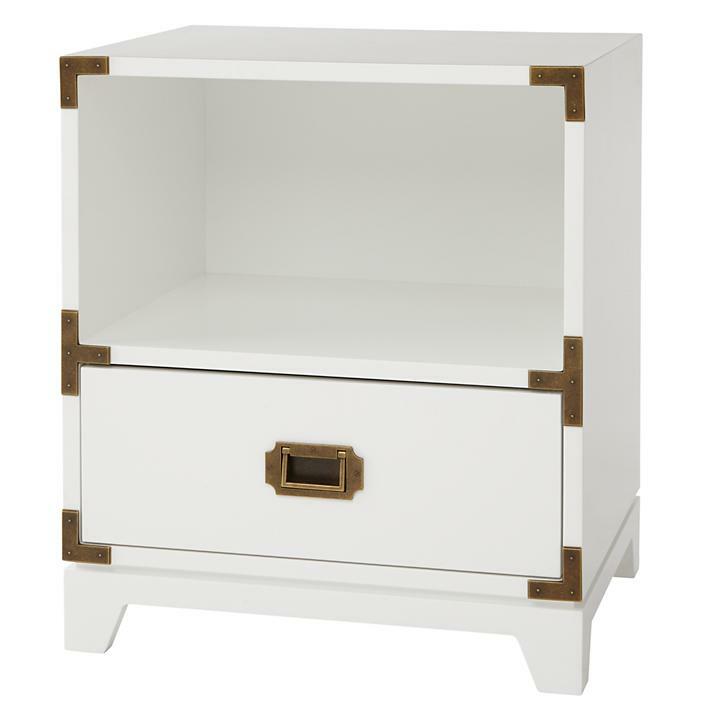 We don't have a traditional "bedroom" set and I'm okay with that since we're still not in our forever home - we might opt not to have a coordinating set when that time comes either, but one thing I've been looking to change are our nightstands. I've had my eye on a few varieties and wanted to see what your vote would be! I find this style works easily for those of us that want to keep with a masculine theme for our spouses, but they are still very versatile and come in a variety of colors. I would lean more towards the grey color because it would compliment our headboard, which regardless of where we move I am not getting rid of! I'm actually not even sure if this nightstand from Land of Nod would work because it's technically for a child's room, but if the sizing works then this would be a possibility! Amazon also comes to the rescue because I found this great option in white, but again not sure the height would work! 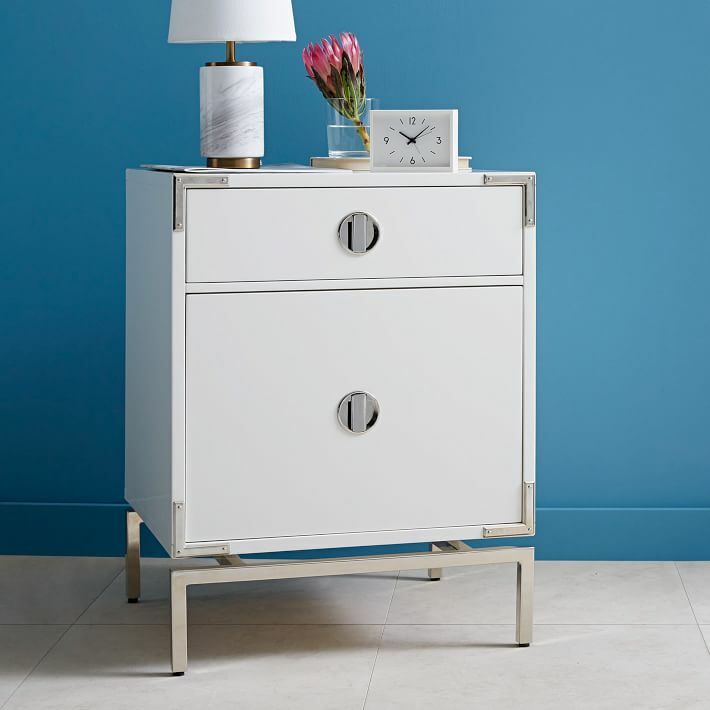 It actually might take some convincing to get Gary to agree to a mirrored nightstand, but there is something about this style that leaves your room feeling more light and bigger! Sadly this appears to be the more expensive options - womp womp! She actually uses the exact same night stands from overstock that I have as a possibility above! I'm actually a huge fan of IKEA hacks and this would be a fun little project to do! 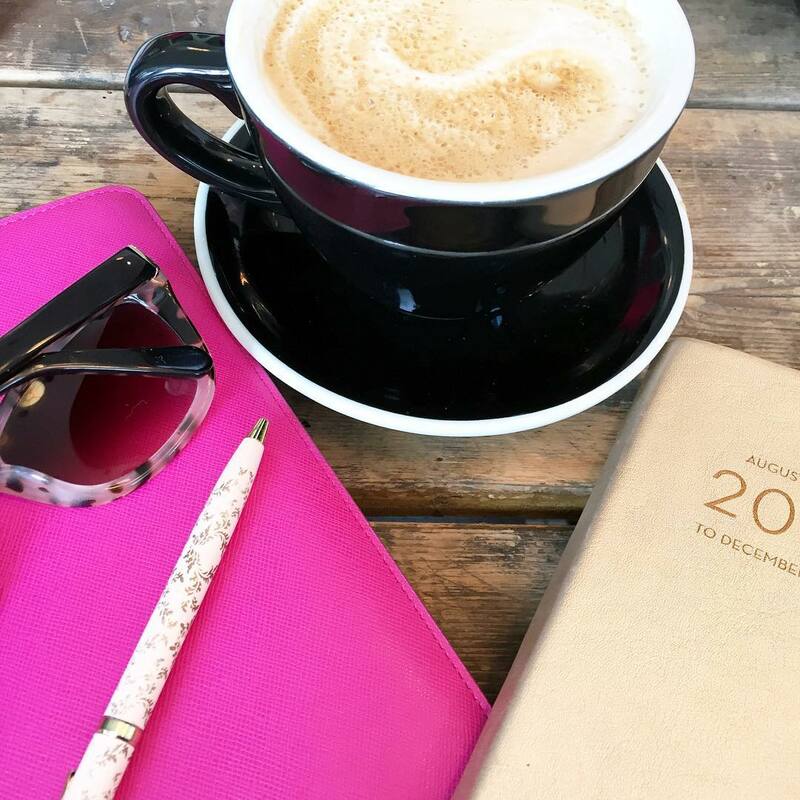 I will have to keep my eye out at HomeGoods because that is where this blogger picked this piece from. Which style would you opt for? 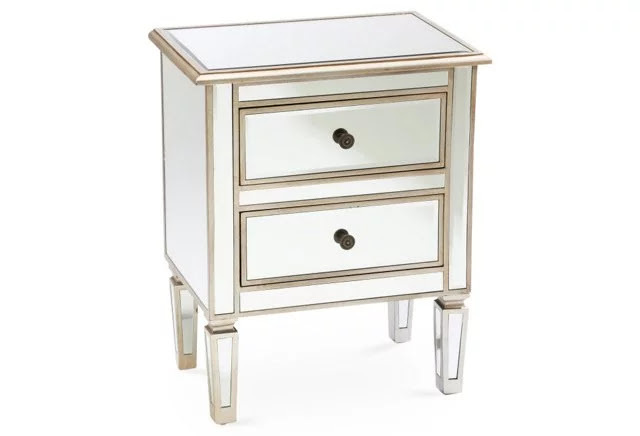 Lately I have been obsessed with mirrored nightstands! I don't know why but I'm just drawn to them! That Ikea hack white and gold one is super cute too. Gotta love Ikea hacks! I now want to change my night stands! Love all of these especially the mirrored ones, not sure that the hubby will update agree! Personally I liked them mirrored look better, even though I'm sure it will be harder to keep clean. It just seems unique and fresh :)! I almost think the one from "alamode" blog is my fav! I love campaign styles! The height depends on your headboard height. 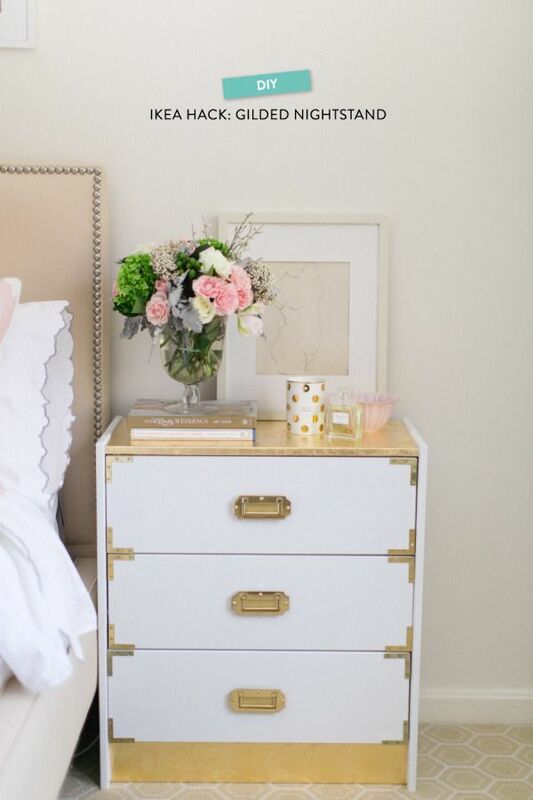 If it’s low, you might be able to get away with a shorter nightstand! I really like the mirrored ones or that DIY hack for the Ikea one!! I've always only had one top drawer or *gasp* no drawer and I know I need at least one drawer but anything more than that leads to a lot of space to fill with junk. I have those dressers for the Ikea hack in my garage just waiting to be put together - forrr like a year. Whoops! I love all these options though - I don't think you could go wrong with any of them! Especially those Overstock options!! Homegoods is the best for finding those little odds and ends pieces that really pull your room together. I love that look of the mirrored nightstands so pretty. i just commented about this on another blog--i am on the hunt for a nightstand too for my other bedroom. i love the mirrored ones. they would be gorgeous. Ok loving all of these! So cute! The white and gold is so pretty but definitely swooning over the mirrored too! I love mirrored nightstands but I don't see men liking them as much! The Overstock ones are great too! The colorful night stand is so my style! I wish they would make those with more than one sliding drawer. It looks so much fun and contemporary! It's all in the flowers! ;) I would so go for the mirrored table if I could keep baby hand prints off of it, but that's not going to happen in my house. You should totally choose that one for me! Oooo! I love all of them!! That Ikea hack one is so cool, though!! I really don't think you can go wrong with any of them. Haha I actually laughed out loud when you said you'd have to convince Gary to get on board with the mirrored nightstand. I have no joke been having the same issue except over a coffee table. What is it with guys and mirrored furniture? It makes the room look bigger and when you don't live in a massive house, that helps make you feel okay with your tiny little space. I really really like the last two! Home Goods always hit or miss for me, I wish I could just waltz right in and find something like that but it never happens. I think the mirrored ones are GORGEOUS! I don't know how hard it would be to keep clean, but I'm obsessed with the look - and I'm imagining how beautifully you could style it.... Swoon!!! These are some fabulous picks! I am absolutely obsessed with the mirror style but I also love the ones with the gold accents! Redecorating is so much fun. 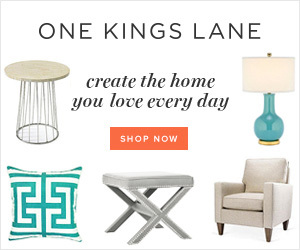 I hope you can find that one at Home Goods, they have the best stuff! That is such a good ikea hack! We need a new bookcase asap and I've been debating trying out one of the hacks Katie posted a while ago. I love all the mirrored nightstands too! Oooooh I'm loving your finds! I love how the white and mirror totally brighten the room!! i LOVE the mirrored ones! Unfortunately, my husband is not quite a fan. One day when we own a house I will have an office where I can put all the more feminine pieces ahaha! Also, please don't forget to get your money and links to me before the end of day today! Loving that ikea hack! I like the idea of antique shopping and mixing and matching nightstands too - obviously two that complement each other. My only necessity for nightstands is a drawer - I need to hide all of my stuff! I love all of the mirrored options - I feel like its a good way to add a tiny touch of glam and sparkle! I LOVE THE MIRRORED ONE! We just got a metal table (it sounds ugly, but I love it) to punch up our living room- game changer! And we got it at homegoods! I love them all! The only thing I would say to think about with the campaign styles is that you can see any cords through them that are plugged in behind them (e.g. lamps, chargers, etc.). I'm dying to get mirrored nightstands for our room, but definitely having to talk Brandon into that one! Gorgeous!! Those mirrored ones are fabulous and unfortunately I have yet to see one that is reasonably priced but oh swoon!! With your impeccable taste girl, you'll nail it and find awesome ones!!!! Happy Thursday!! I am OBSESSED with mirrored nightstands! They make the room look bigger and add a perfect amount of glitz! I love the mirrored ones but am always worried they'll look dirty all the time. Maybe I'll do one for a spare room in the future! Wow, these are great! I love that mirror finish one so much! Our bed actually came with night stands, so I definitely miss getting to shop for some ;) Maybe for the guest room! Loving the mirrored look for nightstands! I've never seen anything like it before but it's totally my style. Keeping in mind for future remodels. 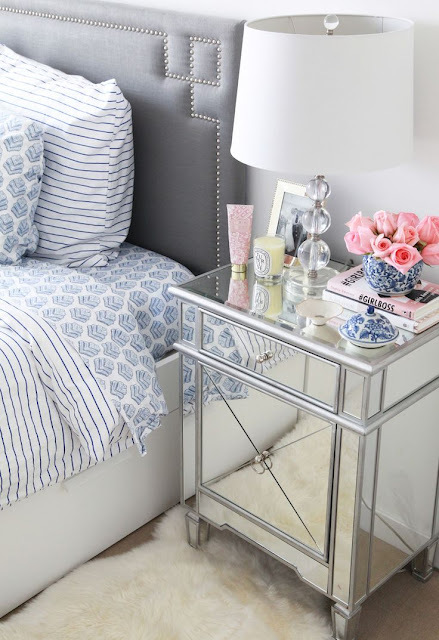 Oh man so in LOVE with that mirrored night stand!! So gorgeous!!!!! Great picks! I have the last one! I got it from overstock + coupon! Love these! Especially the mirrored ones, so pretty! I don't think Adam would go for mirrored either though, lol! The mirrored look is so elegant. I also love how it blends vintage + modern. I love the white furniture in front of the blue wall, gorgeous! Thanks for sharing. I'm on the hunt too and you totally did the research for me!! THANK YOU!!! I love the campaign style! I think the mirrored would be hard to keep clean and even though they are gorgeous, I think it would personally drive me nuts! Both options are super nice! I honestly love all of these options for different room styles! Good nightstands really add a lot to a room in my opinion! 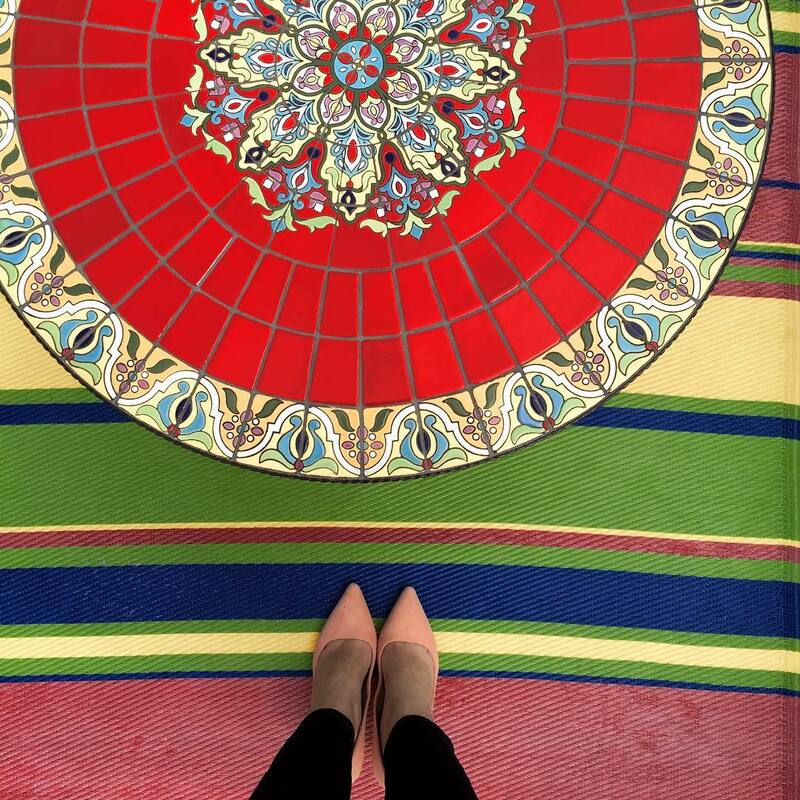 Love your inspiration photos! If you can't get Gary to do the full mirrored look, you could just add a mirror top to a regular nightstand. I love the mirrored night stands. Home Goods in Falmouth, had them and I was so tempted to buy them. I kick myself everyday for not getting them. You have great taste in home decor. I am seriously loving the two that are white with the gold accents! I really love that one with the open section underneath first and the drawer below. 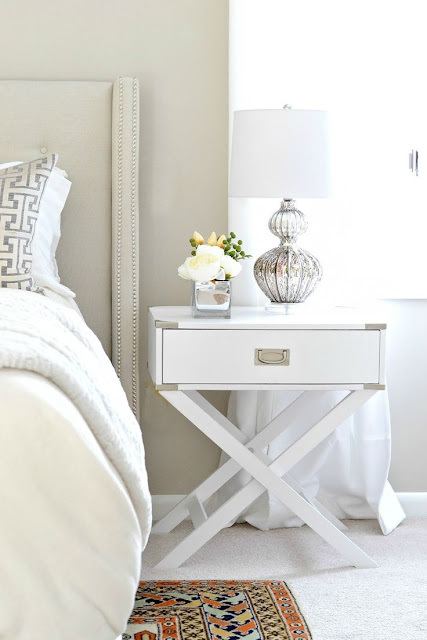 I like the mirrored nightstand...is it weird that I want a matching dresser with mirrors? Great inspiration, definitely going to remember these styles when I start decorating soon. These are some very beautiful pieces, I'm in love the mirrored styles absolutely gorgeous, the only downside I see to these is that you'd probably have to constantly cleaning them so they remain looking fabulous, especially if you have kids, but I still love it. I love all of the looks you shared, but the mirrored furniture is my favorite!!! I would really love a piece like that somewhere in our house. I think I am getting away from wanting traditional bedroom sets and would rather mix and match my stuff to create my own look...which is what I plan on doing in our next house. I have a beautiful set now...but it is so matchy matchy. I love a good campaign-style table/nightstand, so that definitely has my vote! You can't go wrong with either, though - both are neutral and timeless enough that you won't get sick of them in the future. I love when people can put together bedroom sets that don't quite match but look beautiful together! I love the mirrored ones but I have a small storage one like it and it gets dirty and streaky a lot and drives me mad! I love that first set in all the colors! I love the campaign style especially the one from the inspiration look. Love what you've picked out here Biana. I'm still rocking no nightstand on my side of the bed because I can't find the right one - meanwhile the dresser is the night stand for Ben. Eventually we'll get something figured out. I love mirrored nightstands! They just look so chic and clean! Girl you have a hard decision here because these are all gorgeous! You literally have me dreaming of nightstands now. OMG I love the mirror ones. I have mismatched mirrored nightstands that I love! I just had one in college and didn't want to get rid of it, so I found another at Home Goods that worked well with what I have! ooooh so pretty! i really wanted to get some nightstands that have drawers so we could get rid of one of our dresses, but my cats love to lay on the dresser so i don't know if i can part with it now! so maybe i'll get some that are pretty and less functional lol. KC would never okay the mirror ones! boo. i love the land of nod one haha, as long as it's a reasonable size! I like the one ones from the first picture. I think it will go with anything to end up changes to if you move and change things out. It also provides a nice clean look with the bright white. I've been on the hunt for a night stand as well - we moved into our house in May with only a bed - no other furniture! We've slowly been acquiring more pieces. 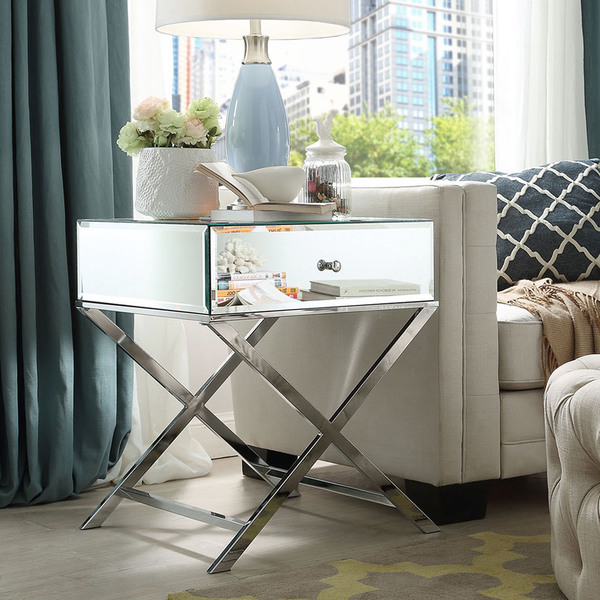 I love the masculine and more simplistic look of the campaign side table, but also do love the girly of the mirrored. The combo seems like a nice compromise - super cute. I love all the mirrored looks! So gorgeous! That grey one is very pretty too!